In many developing countries, one in every 600 children is born with a cleft lip or palate and will never be able to eat or speak properly. These children are often teased, tormented, or even abandoned by their own parents at birth. Most are unable to speak, eat, or drink properly. For the past 10 years, Smiles for Lives has worked with numerous nonprofits, local governments, community organizations, and hospitals to provide dozens of free cleft lip and palate surgeries to children around the world. 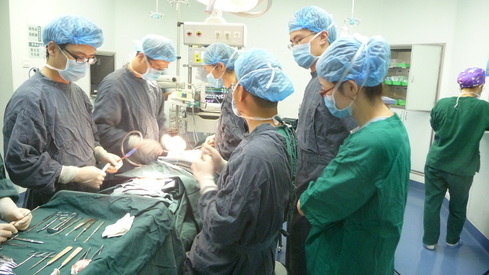 These surgeries have given new life to these children by allowing them to live productive, fulfilling lives. Patients funded by the program receive treatment from the time they arrive at a hospital and all services are free: the initial evaluation, surgery, and post-surgical therapy. These life-changing surgeries are preformed in 45 minutes and cost as little as $250, thanks to support from physicians, participating institutions, and generous donors like you. Smiles for Lives has also funded nonprofits that work to provide state-of-the-art surgical simulation software and medical education grants to participating cleft care teams. Integral to advancing the field, Smiles for Lives also funds and supports research, educational programs about craniofacial anomalies, and awareness campaigns as well. Funds are carefully granted to a number of nonprofits and scientists at leading academic institutions based on previous track record and experience. Each year, students and youth groups around the world participate in Kids Change the World's flagship program, the Smiles for Lives Read-A-Thon. Because of overwhelming participation from previous years, the Smiles for Lives Read-A-Thon is now coordinated by regional directors. Regional directors will work with local chapters and schools to implement the program. Donations and forms sent to international headquarters will still be accepted, but may be delayed. If you do not know if a Kids Change the World chapter is in your area, contact us to find out or start one yourself!